Please read my first A Little Bit Lately post to find out what these are all about, although I’m sure you get the idea. These have been inspired by Sometimes Sweet’s Currently posts so check her out if you like it! I’ve stalled reading my own books again, I’ve just been so busy but we have been doing a book advent for the boys again. Last year I wrapped each book but there was no way I was doing that this time round, instead I’ve decorated a box with Christmas wrapping paper and tinsel and each night there is a new Christmas book for them to fish out. We had a lot of them already, some favourites such as Dear Santa, One Snowy Night, The Christmas Tale of Peter Rabbit. I had bought a couple of new ones myself, the new Mog’s Christmas Calamity I couldn’t resist as all three boys are such big Mog fans! We were also sent a lovely festive selection from Egmont books, they all look fantastic and I’m saving Socks for Santa to go in the Christmas Eve box! I actually had a sneaky read of this one before the boys and it’s really sweet, I can see it becoming a favourite. They also have the most wonderful hardback pop-up and play books; we have The Little Christmas Tree and Nativity Story. The Little Christmas Tree is going to be in our book box tomorrow night and I’m really excited about it. The last page folds out with a pop up tree and you can add decorations from press out pieces in the book. We’ve made our way through a few Christmas films, on a Friday night we have started to let Lucas stay up late and once the twins are in bed we put a Christmas film on. This was a great idea until he kept choosing Arthur Christmas! I’ve been watching The Family Stone, it is one of my favourite lesser-known Christmas films and if you haven’t seen it check it out because I think it’s just lovely, it does make me cry but is so sweet and always makes me want a big family! Should be Christmas songs in here really but I haven’t actually had many on in the house. I was talking with my mum about them though and I love how everyone has their absolute favourite song that will always remind them of Christmas. For me it’s a type of music I would never usually listen to but I remember it being released and singing it with my friends in primary school; All I Want For Christmas Is You, has to be sung by Mariah Carey to really make me feel Christmassy. I even remember the music video! My mum’s one is Driving Home For Christmas by Chris Rea, that is one you can instantly croon along to. Me and the husband had a child free shopping day last week and we headed into Liverpool. Unfortunately the weather was pretty shocking but that did mean we had a good excuse to go for a long lunch at Bistro Pierre and stop for hot drinks! 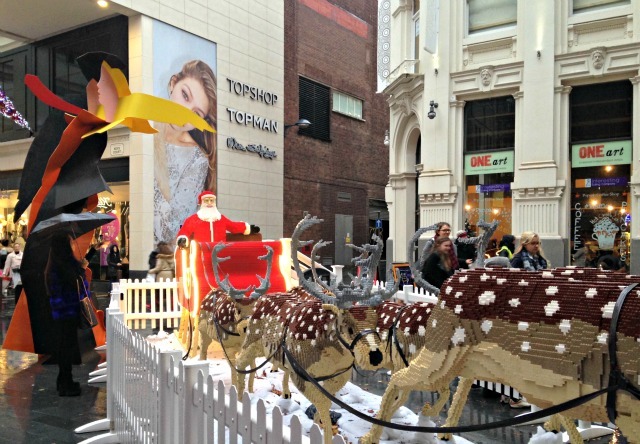 We didn’t do as much shopping, more just mooching and I was so pleased to stumble across the Lego Santa and his reindeer, such a shame the weather was so bad as we had planned to do so much more. Still, we had a lovely few hours together. 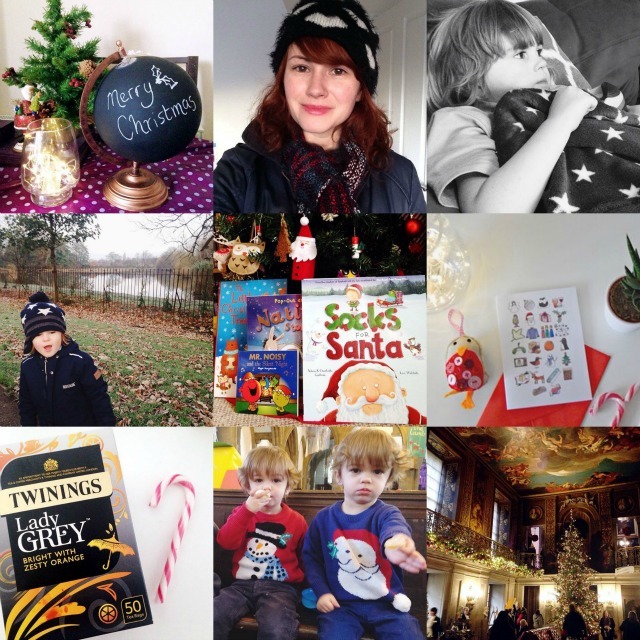 I am thinking about family time this Christmas, every year I take a blogging break over Christmas. I’ll still be on my social media channels and there will be Living Arrows and a post for the twin’s birthday just after Christmas. However, I really love taking the time over Christmas to switch off a little. My husband is off work, we have Lucas back home all day and we have plans to catch up with friends and family. I also want to take the chance to think some more about my blog for 2016, I never have as much time I want to devote to it. Acutally that’s not true, I do but I choose other things over it, quite rightly in most circumstances. I was wide awake last night just thinking more about getting the balance right. I’ve been feeling so inspired about how I want to change my outlook in 2016, not just blogging but my whole life. There is probably a whole post brewing over this but for now I keep scribbling in notebooks, I’m hoping the break will give me chance to get some order in my brain and start the new year feeling refreshed. I’ll take this chance to wish you all a very Merry Christmas, I hope it is spent with loved ones, I hope it brings happiness and I hope you have good food! Some bits of life lately over on my Instagram. Hope you have all had a lovely Christmas, the weather has been mostly shocking hasn’t it?